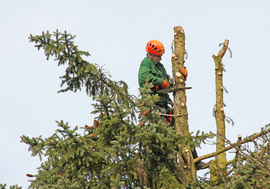 Liverpool Tree Surgeons Services are reliable local Tree Surgeons that specialise in all forms of Emergency Tree Services. Click here to call Liverpool Tree Surgeons Service. Extreme weather conditions, such as heavy winds and storms, can cause trees to fall down, landing on whatever is in their way. Liverpool Tree Service can help you, no matter what time of day or night if your tree falls over. Soil erosion can also cause an emergency tree situation, with your tree leaning to and fro, causing it to look like it will fall over at any single minute. We will have one of our highly trained tree surgeons come out to check on and price up all of your tree emergency needs within a couple of hours. We’ll actively investigate your issue and figure out the best course of action to take to help you out. Then, we’ll have our team come out with all equipment necessary to sort out your tree problem in the safest way possible as quickly as possible. 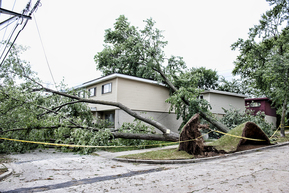 Our team can remove the tree in the safest way while doing our best to prevent any damage to your property. Once we have removed your tree safely, we will then begin the clean-up process sorting everything out. • Removal of trees for construction purposes. • Removal of fallen trees or branches. • Securing trees or branches that are at risk for falling. If you are in need of our emergency tree services, then you have come to the right place. Give Liverpool Tree Surgeons Service a call right away on 0151 380 0007 and we’ll be there as soon as possible.